Every February 8th, Russian military celebrates what’s known as Day Military Topographer. It that confuses you, then no worries. Unless you’re someone who is familiar with the military world or someone who works in the military, the chance is that you probably haven’t heard about Day Military Topographer, or even a military topographer itself. Let’s just say that in essence, military topography is a branch within the military. Just like infantry, paratroopers, navy, and other division, a military topographer is a necessary unit in Russian military defense. They carry equally important task as any other military division. And every year they are granted a professional holiday called Day Military Topographer, which falls every 8th of February, 2 days after the Day of Science. This profession is quite interesting as it is also important. Even if the military isn’t your object of interest, it would not hurt to get to know more about this profession and its special holiday. This article will walk you through the duty and roles of military topographers, and What you need to know about day military topographer in Russia. Even though you might never hear about a military topographer, you might guess what it is from the word topographer. Yes, the topography is related to map, basically. Topography is a study about the shape and land contour of an area. A military topographer is someone who studies land contour and features for military purpose. if you want to know more about the military in Russia and its history, you might want to check out other military-related holidays in Russia, and Moslem soldiers and women role in Soviet military. It’s a professional holiday for military topographers all across Russia. It’s an appreciation day for this military division who have fought and provide their service to the country. Although military topographers, in general, support, they also often go in the frontlines during a military campaign. The world war II, or what Russians called the great patriotic war, was when Russia lose a great number of military topographers. In this day, the day of military topographer is also an opportunity to remember those who have fought and fallen. Topographic service in the Russian military is responsible to provide information regarding battle terrain. Their task includes creating military maps, from manual to digital, electronic maps and they also responsible for other cartographical works. The map created by military topographers must be updated on a regular basis, providing the latest geodetic directories, aerial view, and other useful information. Information provided by topographers is used further to make more crucial decisions, such as rocket launching, aircraft flights, firing artillery, and other combat strategies. This is why the role of topographers have always been important. 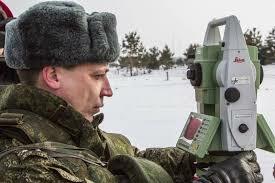 Military topographers are called the eyes of the army in the Russian military. This is because they provide insights in which other divisions in the military take action, acting as other the hand and the feet of the army. In general, a military topographer task is to give support for combat. Since Russia is vast from end to end, the existence of military topographers is always needed and a lot of them are required. Russia undergoes rapid change even since the day of the tsar. Russia is also known to change town and cities names often, especially with the rise and fall of soviet union. Hence why updated cartographical information is necessary. The importance of military topographers is strengthened by official support from the Russian empire. With a release of a decree by Russian Tsar Alexander I, the position is recognized. The date of the decree is February 8, 1812, hence why the date now is used as the official holiday of military topographers. The amount is around 900 millions topographic maps. Considering the size of Russia, this number is somehow understandable. This is why plenty of recruits were needed especially during the Soviet era, where there are wars everywhere, inside the country and abroad. The position was sought after and special attention was given for this division. Unlike many other parts in the world, Russia actually has special schools for military topographers. Such schools, for example, are the revolutionary school of topographers, Leningrad military-topographical school, and military topographic cadet school. Military academy also has department specialized in military topography. The fall of the soviet union marks a significant change in the Russian military. There was a big change in Russia back then and the military was also got the impact. For example, there was a budget decrease for the military. Many military topographers were forced to be out of service. Their number is no longer as it was before. It is unfortunate since the fall of soviet union marks a huge change too regarding Russian territory. Many countries separated from Russia, towns, and villages changed their name, and when things got better, new towns and settlements have appeared all over the country. This should be the time when military topographers are most needed. In modern days, the role of cartographical works is assisted by technology. Military topographers now do not need to work alone. Their role is made easy by technology which continues to advance these days. Maps are mostly digital, and satellites help to get a real-time condition to a certain area. If anything, become a military topographer sounds interesting nowadays.